Christmas just isn't Christmas without cookies. Lots of cookies. 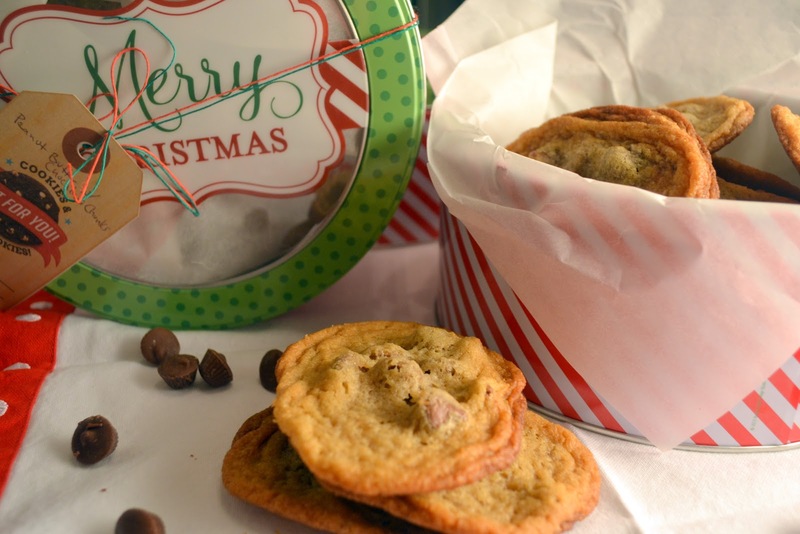 So this year I decided to participate in The Great Food Blogger Cookie Swap. The premise is pretty basic: bake three dozen cookies, send them to three fellow food bloggers, receive three dozen cookies from three other food bloggers and then post your cookie recipe. As if oodles of homemade cookies weren't incentive enough, participants made donations to benefit Cookies for Kids' Cancer. Signing up was the easy part. Deciding on a cookie recipe was a little harder. It occurred to me that I'd never mailed cookies before and there's a lot to consider. Cookies don't last very along around here so I've never had to think about longevity or how well a cookie will travel. After scouring my cookbooks for a couple of weeks, I finally decided on Peanut Butter Cookies with Milk Chocolate Chunks from Baked New Frontiers in Baking. I figured it's hard to go wrong with peanut butter and chocolate, right? The Farm Girl Cooks - Warm, soft, chewy Molasses Spice Cookies. Sweet Tea and Sunshine - Strawberry Thyme Shortbread w/White Chocolate & Walnuts that were unusual and absolutely delicious! In the bowl of an electric mixer fitted with the paddle attachment, beat the butter and sugars together until fluffy. Scrape down the bowl and add the eggs, one at a time, beating until each is incorporated. The mixture will look light and fluffy. Add the vanilla and peanut butter and beat until just incorporated. Drop the dough by rounded tablespoons onto the prepared baking sheets, at least 2 inches apart. With the palm of your hand, very gently press each cookie down so it forms a very tall disk shape. Do not press too hard and do not press it flat. Sprinkle the tops of the cookies with granulated sugar and bake for 10 to 12 minutes, rotating the pans halfway through the baking time, until the tops of the cookies just begin to brown. The cookies can be stored, in an airtight container, for up to 3 days. I realized going into this that I had never mailed cookies before either. It was a fun experience though. This sounds so much fun! How did you get involved in it? And how come there isn't a KYFB cookie swap? Hi Jenn! I remember reading about it last year and signed up as soon as the event was announced. I think a KYFB cookie swap is a fantastic idea! Maybe we could work on that next year? These were SO incredibly delicious - thank you for making and sending such wonderful cookies! Yours were the first package we received and you absolutely set the bar high for everyone else. Happy Holidays!! Great for on the Christmas go snack, also great lunch snack for my son.